TAOnline staff has meticulously organized the most current and relevant transitioning military related books to help you easily determine the reading material most suitable for your situation. Click through the Title links below to get a quick synopsis of each book of interest. 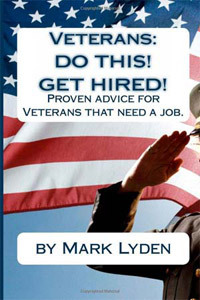 This book has one primary purpose: To Get Veterans Jobs! With the help of veterans from the Army, Navy, Air Force, and Marines this book was written by a current Professional Fortune 50 Lead Recruiter with nearly 15 years of experience. Because the author recruits as his profession in this challenging job market every day, he knows what works and what doesn't. This is a no-nonsense guide to help vets get hired, even in this difficult job market -even if nothing else has worked.